I have had a somewhat negligent relationship with my skin in the past. I avoided skincare like the plague and prided myself on only cleansing with hand soap. It was a great time in my life, easy to get ready, and for the most part blemish-free. But all that changed when I passed 25 and started noticing…pimples. WHAT?! Now, these are not huge breakouts or acne spread across my pale freckled skin, but the kind of pimples that sneak up on you, hide deep down and last forever! And they have chosen to coalesce in clusters on my chin on the two edges just below my mouth and it drives me insane. Right then and there, when I noticed the pattern of a never-ending pimple was when I decided that I would invest my time in skin care. Masks, moisturizers, cleansers, and serums you name it, I’m here to try it. But, yet in the last three years, I had never thought of a face peel. I had always seen them in ads or on TV (when I indulge myself in some reality television) and felt that they were either too expensive, too time-consuming, or just plain unappealing (pun not intended). And then came Philosophy. 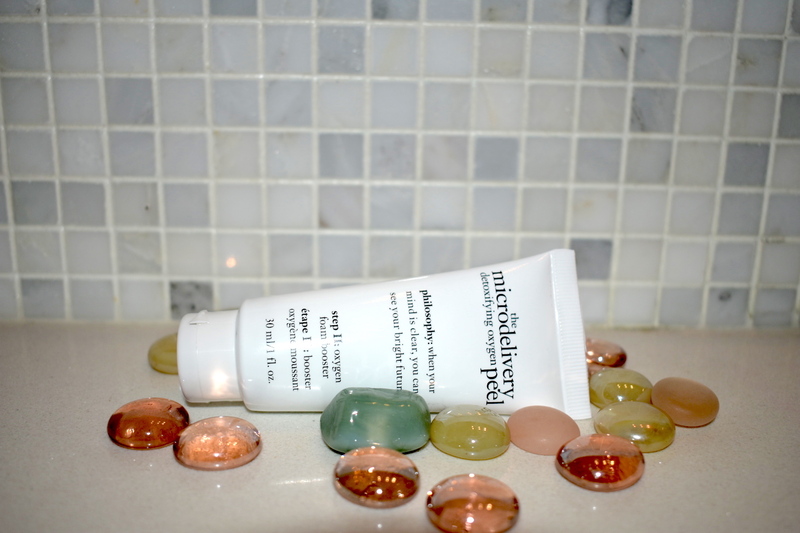 With the “mindful beauty that is more than skin deep” and their philosophy to: “Cleanse daily, peel weekly, and treat the skin with expert formulas, returning it to its ideal state,” and, it wasn’t crazy expensive! “I don’t have to heave myself across town and spend hours in a spa to get the glowy, fresh skin I desire”. 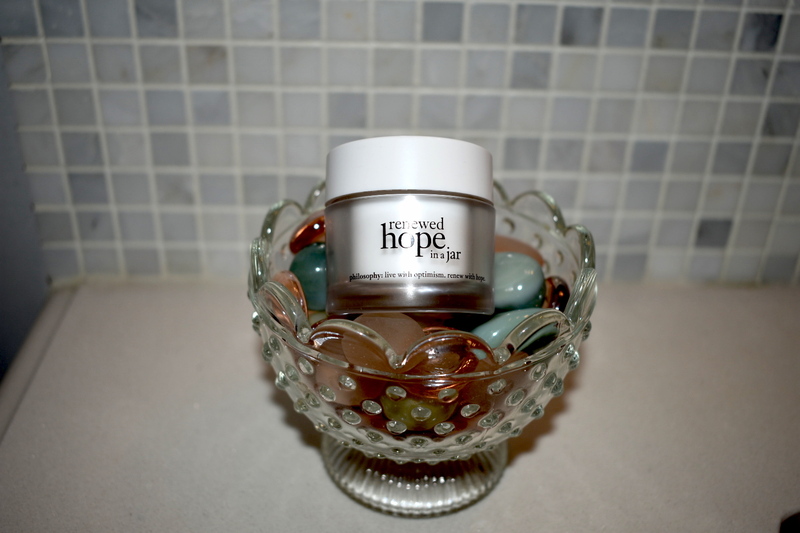 So, for the last week, I’ve been “philosophizing” with Philosophy, using their Microdelivery Detoxifying Oxygen Peel and Renewed Hope in a Jar moisturizer to see how they work! Ok, ever since I found it, I have been a fan of Glossier’s Priming Moisturizer. Mostly because despite my recent foray into skincare, I still like to keep things light. I never want to feel like I’m bogging my skin down with products. With that said, Renewed Hope in a Jar might be my new favourite. It has a super lightweight texture and quickly absorbs into your skin, so you’re not sitting there with sticky skin waiting for it to dry to apply your makeup. The packaging recommends applying the moisturizer in the morning or night, but as any Canadian can attest, our winters are harsh, and you’ve got to amp up your moisture routine if you want to survive, so I’ve been applying it both in the morning and evening before bed. The faint scent and light texture have left my skin soft and smooth throughout the day; I’m not itching to re-moisturize at the end of the day because my skin no longer dries out as quickly. And, in winter that’s always a plus! As I said earlier, I’ve never done a face peel before, so as my first attempt with a DIY one, I was a little nervous. Does it peel my skin? Will it hurt? Do I have to wait for it heal? I had a lot of misconceptions about this face peel I was about to do. But I soldiered on as planned. Now, the peel’s instructions include 3 fast and easy steps. Use the plastic shaver to remove the mask and then wash off any excess. Fairly simple instructions and I was impressed with how quick it was to do. A 10-minute peel reasonable If I’m expected to peel every week (as per Philosophy’s philosophy). And while the actual process of the face peel quelled any concern I may have, there were a few things I wasn’t expecting. First off, the peel felt warm on my skin. I’m so used to masks that cool that I thought I messed it up, but all is good. Secondly, I didn’t know that it foamed. Yes, yes, the second step literally says FOAM BOOSTER, but I thought it was just excess verbiage, but nope, it foamed. It foamed way more than I anticipated and you could hear it bubble. I had a lot of fun with that part. All in all, the peel was easy to do, my skin didn’t hate me, cry or need to heal, and after a week of the peel and moisturizer, I feel like my skin has been living its best summer weather life despite the frigid below temperatures.